SUPERIOR QUALITY: Ashwagandha (Withania somnifera) has been used in Ayurveda for thousands of years as an apoptogenic herb. The most generic form of Ashwagandha is “Powder/Root”. Blue Lily Organics Ashwagandha powder is carefully harvested, dried, and ground into an extremely fine powder for easy mixing. AMAZING SUPERFOOD: Ashwagandha as a superfood, improves the body’s immunity system, reduces stress and Anxiety. Not only anxiety but enables the whole body to reserve energy throughout the day. It is commonly used by both men and women, it enhances Vigor and Vitality. 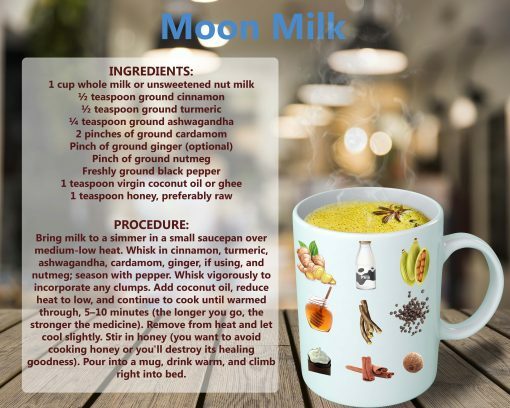 EASY TO USE: Regular uses of Ashwagandha powder with a cup of milk or banana milkshake promotes muscle strength, keeps your heart healthy. Blue Lily Organics commits in producing the highest quality organic products using USDA certified organic herbs that sustainably sourced and traded. 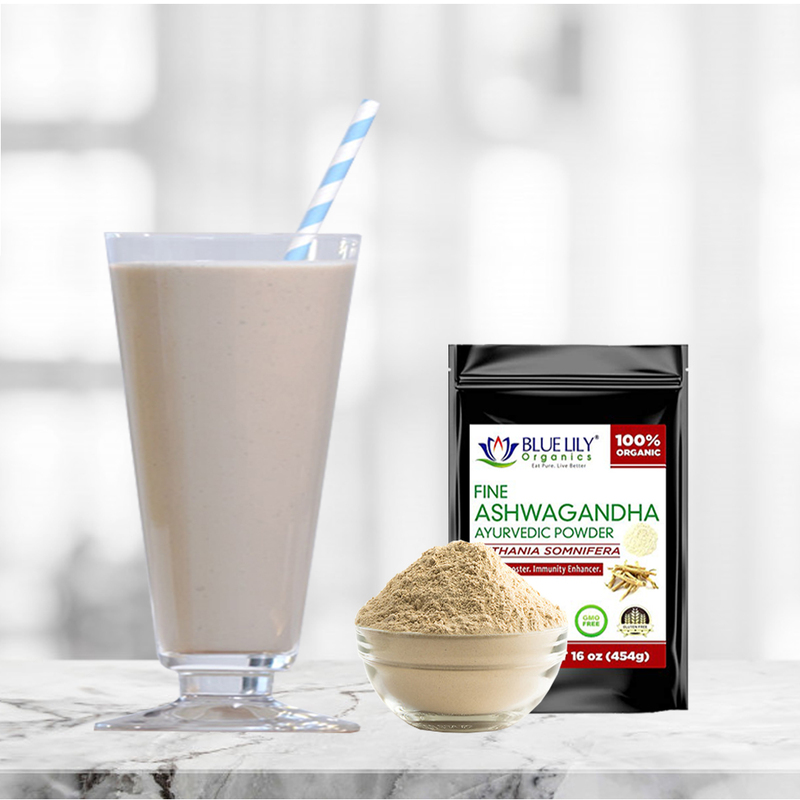 SUPERB VERSATILITY – Our Ashwagandha Root powder can be used to enhance a variety of recipes including smoothies, baked goods as well as savory items. This delectable superfood will enhance the taste and flavor of any modern-day recipe while increasing the nutritional value of your meals. CERTIFIED ORGANIC: Certified USDA Organic Ashwagandha Root Powder by CCOF. Non-GMO and Gluten Free. No Preservatives, No fillers, No chemical additives. Try our Ashwagandha root powder. If you do not like our product, we will simply issue refund request. No questions asked. That’s our iron clad guarantee. 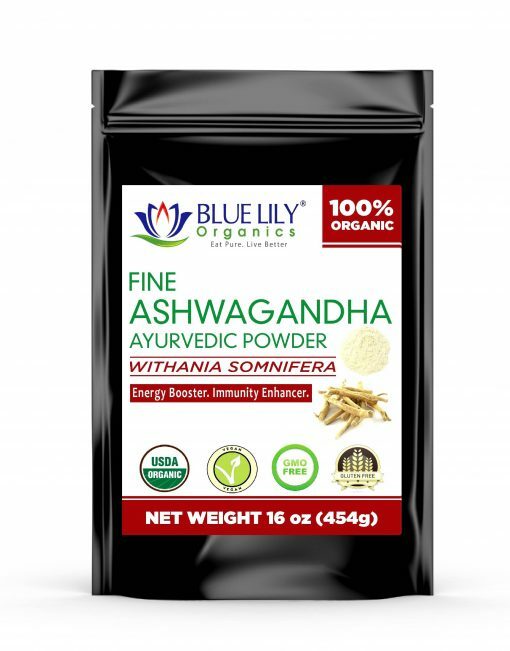 Blue Lily Organics Ashwagandha root powder is an amazing super-food that incorporates into healthful recipes like granola and homemade raw treats like energy bars and cookies. Ashwagandha (Withania somnifera) is a small perennial shrub with yellow flowers and red fruit that hails from the same family as the tomato plant. The brown root of the ashwagandha plant has been an integral part of Ayurvedic Medicine for millennia and is the part most often used for its health benefits. BlueLily Organics Ashwagandha Root Powder made by carefully harvesting, drying and grinding the root of the ashwagandha plant. Ashwagandha boasts a variety of constituents that may be responsible for its healing properties. It includes alkaloids, steroidal lactones like atropine and cuscohygrine, and flavonoids. Rich in choline, fatty acids, and amino acids, Ashwagandha Root finds to possess anti-oxidant properties. Used for centuries by people on multiple continents as the go-to remedy for supporting a healthy immune system. 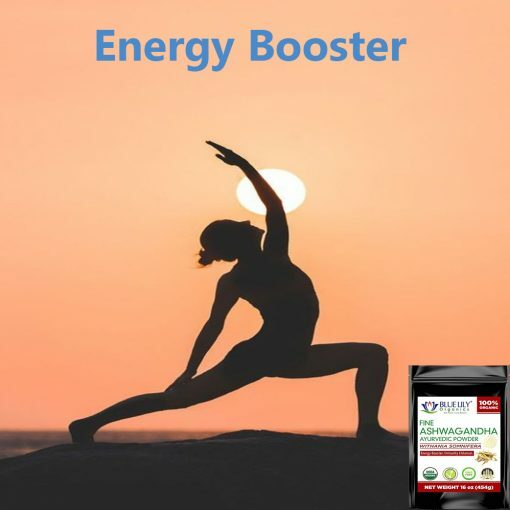 Ashwagandha Root powder also revers for its ability to support cognitive health. Other possible ashwagandha benefits include promoting a healthy mood and overall feelings of well-being. Modern scientific studies stand behind ashwagandha’s age-old reputation as stress- and anxiety-soother and cognitive tonic, as well as its ability to support vitality and feelings of well-being. Double-blind placebo-controlled studies have also hinted that ashwagandha may help maintain healthy levels of cholesterol already within normal ranges. 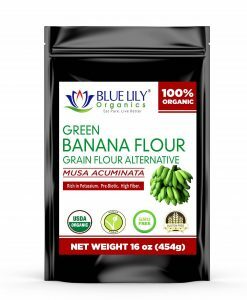 Blue Lily Organics organic Ashwagandha mild flavor makes it a perfect addition to beverages like smoothies or the non-dairy milk of your choice. Make your own soothing, healing tea by adding Blue Lily Organics Ashwagandha Powder to a cup of boiling water. 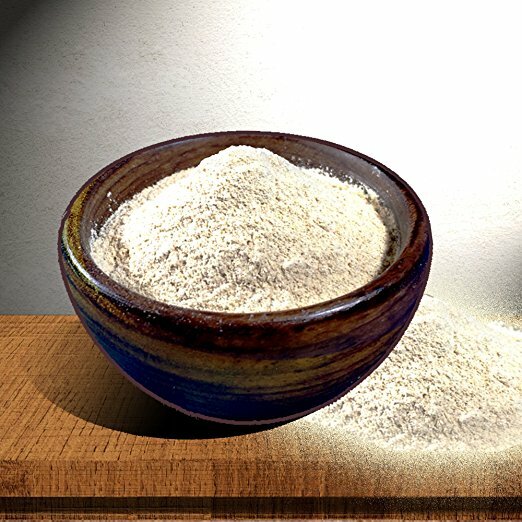 Taking a specific extract of Ashwagandha root (KSM66, Ixoreal Biomed) at 300 mg twice daily after a 60-day meal seems to improve the stress symptoms. It appears that Ashwagandha can lower blood sugar levels in people with diabetes. There is some evidence that Ashwagandha may lower cholesterol in patients with high cholesterol. Blue Lily Organics Ashwagandha Root Powder is non-GMO, 100% USDA Certified Organic, and contains no artificial additives or preservatives.